Japanese Garden - Hayward, Calif.
JGarden Description: This site includes a koi pond, teahouse and several viewing pavilions set along a ravine. 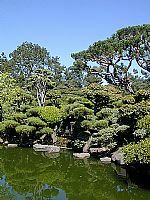 More than three acres of Japanese and native California trees, rocks, and plants are arranged in traditional Japanese style. The area also includes a small pond containing koi and golfish, as well as a teahouse. Doss, Margo Patterson. " A Terrific New Garden." San Francisco Chronicle magazine. March 27, 1985, p 4. Kimura Kimio. "Japanese Landscape Design and it's Applications." Master's thesis, University of California, Berkeley, 1971.